Designed to go the distance, the Mefo Explorer Dual Sport tire is a tough dual sport tire designed to handle the longest and toughest adventures. The chevron tread pattern handles dirt and pavement equally well, giving you stable handling on or off the pavement. An excellent 50/50 tire, the Explorer has a stellar reputation for durability and longevity. Note: Tires have black lettering, not white as shown. Sizes 140/80-18 70R TT and 150/70-18 70R TT may be labeled as "Super Explorer" but the tread pattern is the same. 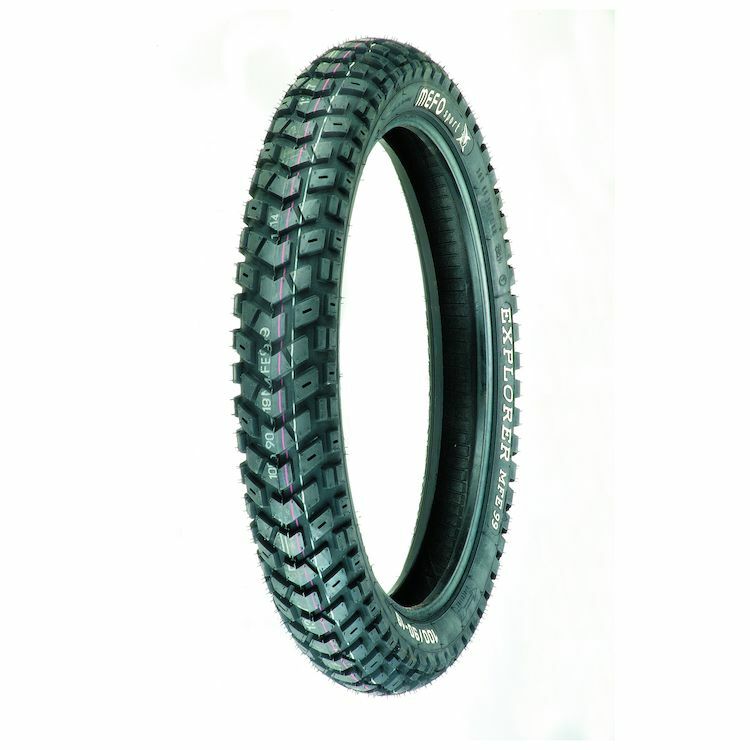 MEFO recommends at least 30.5 PSI in this tire for best performance and wear on motorcycles with an engine displacement of 650cc or less, and at least 35 PSI on motorcycles with an engine displacement of greater than 650cc. I run this as the rear on my 2017 Africa Twin. It handles everything and does it well. It is paired with a TKC80 front tire, sand,mud,river crossings, rocky hill sides and desert landscapes. I will be using this as my go to tire. 8k on my last one . I live in Western Colorado and travel dirt and ATV roads overland into UT/WY quite a bit. A great 60-40 off-road biased tire. I have run these on my 950 ADV and my 990ADV-R. I'd say it is definitely the best 60-40 available. I avoid pavement unless absolutely necessary, but they perform great on pavement. Obviously, mud would not be a strong point for this tire, but everything else (even sand) it does very well. Purchased both front and rear for my Honda CRF250L. These tires are Phenomenal on gravel and dirt roads, they are excellent on the pavement as well. The tread life is excellent. These are a 50/50 tire and they truly are one of the best on the market. Grip in mud and dry sand leaves much to be desired and these do not replace a knobby tire, but they offer a fantastic compromise for those who ride a lot of miles on tar and dirt. I just mounted Mefos front and rear on my 2016 Honda Africa Twin. I have about 3k miles on them now. The front tire is very different than the Explorer front I had a few years ago. The new one has much more aggressive tread blocks. The tires look like they will last about 7k miles so I am happy about that, but they are very noisy between 40 and 55mph. Plus I can feel a tread vibration as I come to a stop on the brakes. They are every bit as noisy as a DOT knobby. easily the best rear tire I put on my 640 ADV for adventure touring, close to 5000 miles and never felt wanting for grip in any condition. Carcass is stiff enough to not worry much about pinch flats or even running flat. I ride a Yamaha bolt and this tire is great on and off road. No wobbling at highway speeds and grips like no other in the dirt. Mounted these up on my 07 KLR. Did the install myself without balancing (no issues over 2k miles on a trip). Tires look great and are excellent in all types of off road conditions. Sidewalls are not overly stiff such as K60s, making installation fairly easy. They started to wear oddly and a few cracks formed on the tread blocks after about 4K miles, but they are very off road biased, so that's to be expected with a lot of interstate travel. Now in the rain, they WILL try to kill you. Allow a lot of extra stopping distance. This isn't unusual for a 60/40 tire, but it can be alarming coming from something like a Michelin anakee wild or continental trail attack. Cornering traction on pavement is also not that great, as the tread is soft and you can feel the tire squerm under fast cornering. Would buy again for sure, especially for trips that are primarily off road such as the Trans Am trail or if you only use the bike to ride to and from trails. I ride too much pavement to have them on my daily ride. Maybe I should buy another motorcycle or two... Overall a great 60/40 tire.